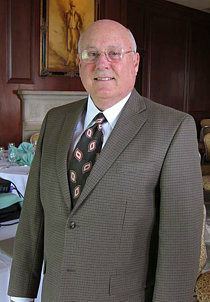 Dr. Robert S. Sherins is a retired board certified diplomat of the American Society of Ophthalmology. During his career as an ocular surgeon and specialist in diseases of the eye, he became especially interested in the history of medicine in West Los Angeles where he lives and practiced. In 1985, senior emeriti of the Bay Surgical Society (West Los Angeles) encouraged Dr. Sherins to become the historian. His foremost interest in the history of the medical institutions where he trained, affiliated and served in chair positions, was launched: UCLA Jules Stein Eye Institute; the Wadsworth Veterans Hospital, West Los Angeles; and Saint John’s Health Center, Santa Monica, California. He also devoted himself to researching his family heritage from Eastern Europe, became president of the Polish Genealogical Society of California and investigated his genomic ancestry, tracing prehistoric ancestors through the DNA mutations. His publications reflect the profound interest he has in discovering scientific information about the origin of Homo sapiens, and both the cultural and physical human anthropology. This website was dedicated by Dr. Sherins to preserve this information for the public, free of charge. To ensure access to the archival materials contained in his publications, Dr. Sherins gifted his works to several libraries: California State History Library, Sacramento, California; UCLA Chancellor’s Archives; UCLA Biomedical Library; UCSF School of Medicine, Archives and Special Collections; Chancery Archives of the Archdiocese of Los Angeles at the San Fernando Mission, San Fernando, California; Stanford University, Lane Medical Library; the Huntington Library, San Marino, California; the Santa Monica Central Public Library in Santa Monica, California; and the History Library of the Veterans Administration, Central Office, Washington D.C. Within this website are links to the index of the books and articles, as well as galleries of Bernard Zakheim creator of the magnificent frescoes at University of California San Francisco, Cole Hall and Toland Hall. Copyright © 2015-2019 Robert S. Sherins. All Rights Reserved.